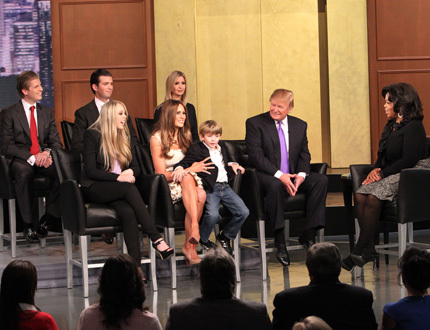 Billionaire dad Donald Trump,his wife Melania and his five children—all together today on Oprah! His beautiful and pregnant daughter Ivanka will also be on the show. The Trump family is appearing on the show. Oprah also puts The Donald to work in his Trump Chicago hotel as dog walker, bellhop, housekeeper and more. Watch Oprah today! Here is a glimpse of the the first appearance on Oprah with all five of his beautiful children. Watch the show onOprah Today.